Three types of corn seed grow in the United States--including grain corn, sweet corn and popcorn. An annual plant that thrives in warm weather, corn grows from a seed into a plant that reaches up to 20 feet in height. Each plant bears from one to three ears of corn enrobed in papery husks. Each kernel of corn consists of an outer thin covering, an inner layer made primarily of starch, and an embryo containing the structure for a new plant if the seed gets planted. Grain corn further breaks down into four types, including dent corn, flour or soft corn, waxy corn and flint corn. Dent corn, the most common grain corn grown in the United States, according to Purdue University, features an obvious depression or dent at the crown of the kernels when mature. The kernel consists of a hard starchy substance at the sides and a soft starch in the center. Flint corn, another popular type of grain corn used in fields, forms a hard starchy layer around the entire kernel. The starchy layer allows the kernel to dry without developing a dent. Flour or soft corn consists almost entirely of soft starch with a thin layer of hard starch surrounding the kernel. Waxy corn gets is name from the waxy look of the kernel when cut open. Waxy corn sees heavy industrial use while also offering a good source for livestock feed. A popular type of corn grow in gardens as well as commercially, sweet corn comes in yellow, white or bi-colored ear types. According to Purdue University’s Department of Horticulture, sweet corn requires pollination in order to bear ears of corn, but you need to keep the plants away from nearby field corn or popcorn. Otherwise, the sweet corn might get pollinated from these types of corn, and produce lower quality ears. Consider planting sweet corn in four or more short rows to help with pollination which occurs through the wind. For a continuous supply of sweet corn, plant the seeds every two weeks. Plant the first round of sweet corn in a sunny area in well-drained soil 10 to 14 days after all danger of frost passes. Popcorn varieties consist of white, small and large yellow kernels. 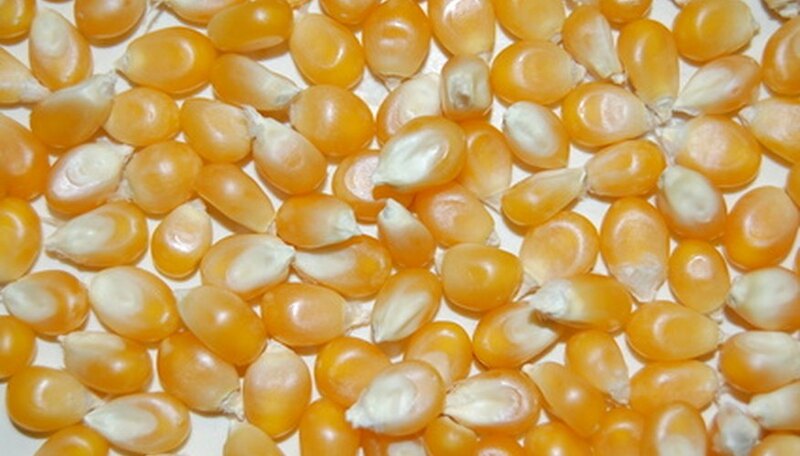 White popcorn kernels feature a rice shape while yellow popcorn look pearl-shaped. Specialty popcorn features blue, red, black or brown kernels. Popcorn grows best in well-drained medium to coarse soil where adequate rainfall occurs. According to the University of Wisconsin Cooperative Extension, popcorn plants must grow to full maturity in order to reach their maximum popping potential, a factor that remains important in commercial popcorn fields. For gardeners who want to give popcorn a try, plant seeds in early May when soils warm to temperatures appropriate for germinating the seeds. The plants require full sun and prefer coarser soil types, but do not need protection from nearby field or sweet corn plants since pollination does not affect the popping quality of the corn.